As crawl spaces can have many different issues, they also have many different options for solutions to fix those issues. Given their unique features, crawl spaces require specifically-designed products and solutions in order to be properly repaired. Trust the crawl space experts at Total Foundation Solutions to provide you with the best possible crawl space solutions. It is our duty to fix your crawl space damage and provide solutions to prevent future problems. If you notice any symptoms of crawl space damage, contact our experts to get your free estimate. Catching problems early is critical. Unfortunately, any problems with your crawl space will only get worse over time if they’re ignored. As a homeowner, make it a point to regularly check your crawl space for any signs of issues to make sure you can catch it early. Even the subtlest signs of damage should be taken seriously. Although it may not seem like an issue at the time, you’ll be glad you got it taken care of early. Putting off crawl space repairs will only result in more headaches and bigger expenses. Water damage that is left untreated can result in mold growth, wood rot, or musty odors that can impact the air quality inside your home. It can also weaken the wooden floor boards and joists and compromise the structural integrity of your home. If you notice any signs of water damage, whether big or small, contact our experts right away. How do you know what’s best for your crawl space? Leave that up to our experts. We will provide a free inspection to come assess your issue and see what’s causing the problem. Our team has extensive training to identify these crawl space problems to know what’s causing the issue and how to properly fix it. If our team finds any symptoms of water damage in your crawl space, we will pinpoint why it’s happening and where it’s coming from in order to provide the best possible solution. We will also search for any structural issues provide a solution to stabilize your crawl space. When it comes to crawl space issues, not every home is treated equal. 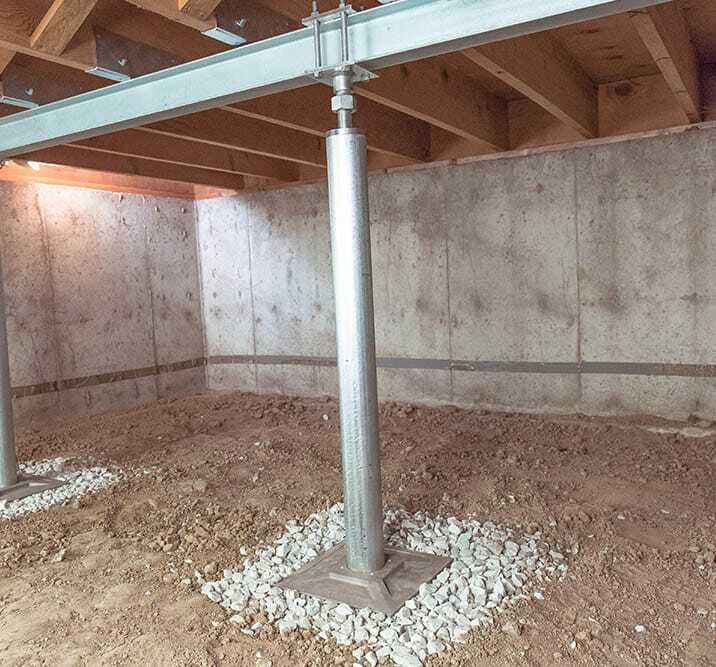 At Total Foundation Solutions, we offer customized crawl space solutions to repair the issues and maintain a dry, healthy, and functional space. A common problem in crawl spaces is that the wooden floor boards and joists become weak. As they weaken, the floor above is no longer supported and can cause uneven floors inside your home. At Total Foundation Solutions, we use The SmartJack® System to lift your sunken floors back into place for permanent stability. The SmartJack® comes with many different benefits to protect your home from structural damage and is adjustable for additional support over time. Learn more about our crawl space support posts. Encapsulating your crawl space is a quick and easy way to eliminate most crawl space problems. Our team can install a thick vapor barrier that completely covers the inside of your crawl space and protects it from water damage, mold growth, and pest infestation. Crawl space encapsulation also provides you with extra storage and creates a dry and healthy space. Total Foundation Solutions has proudly provided residents of Northwestern Pennsylvania and Western New York with crawl space solutions for over 30 years. We don’t want you waiting long for your crawl space to become a clean, functional space, which is why we are able to install most crawl space solutions in just 1-2 days. Prevent your crawl space problems from getting worse and contact our experts today for a solution. Contact us today for your free crawl space solutions estimate!